Yup, I’m the last one to get ankle boots. It’s such a shame. I do have these Frye boots that I bought years and years ago, before ankle boots came back into style, but they really go above my ankles, so they are more like low-calf boots. I can’t wear them with jeans, just skirts and dresses, which kind of defeats the whole ankle boot movement, right? I’m not sure that this color goes well with my skin tone (pink and pale), but I do love it and think it would be great with jeans or with black pants. Love the worn-in look and I’ve had Matisse shoes in the past that have been amazing and well-worth the price. The heel is a bit higher than I’d like for an everyday boot, at 1-1/2 inches. These are so pretty and since they’re Kork-Ease, I’m sure they are very comfortable, as well. I love the color, which could be worn with practically anything. These are the dressiest of the four pair and I’m not sure that’s what I’m going for. I’ve had my eye on a pair of these for ages. They are obviously much different from the others, being much for casual, but I think that I’d wear them a lot. And, I’m a clumsy girl, so I like the look of that rubber sole! Of course, at this price tag, these are my favorite. 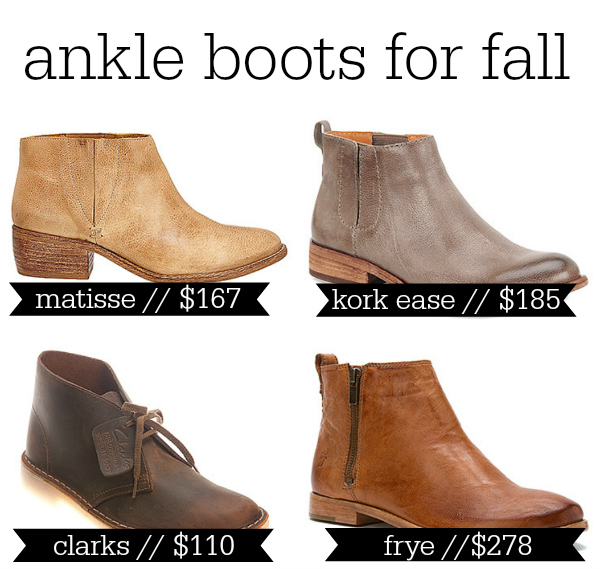 I know that spending the money on a pair of Frye are worth it, as they literally last forever, but ouch. Nearly $300? I really love that there is a side-zip on these boots, not just for the easy on/off access, but for the look of being able to leave it half-zipped for a more casual feel with jeans. Which pair are your favorites? companies and I love working closely with them to feature their products. Thank you for shopping with the brands that I work with and that support bellingFAM. This entry was posted in Fashion & Style, Mom Style and tagged Mom Style, OnlineShoes.com, Shoes for Moms on July 28, 2014 by Katie Kavulla. Thanks for posting this! I was looking for something like the Sam Edelman Petty Boot (low heel, narrow toe) in a taupe that is smooth leather instead of sueded (better for wet weather). I think the Matisse Dodge Boot fits the bill. I ordered it, so will try them out and compare. Thanks for sharing! nice ankle boots. just what I need to give my combat boots a rest for a while.